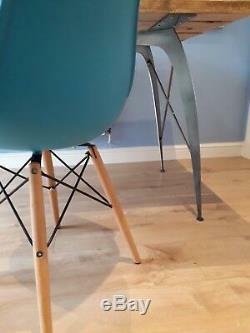 The' Teamster' is our very own unique handmade steel table leg design to compliment the much favoured Eames dining chair. Dimensions : 82cm wide (TOP BAR) - LEGS ARE 64 cm APART AT BOTTOM x OVERALL HEIGHT 71cm high x 30cm deep (CURVE OF LEGS) and made from thick steel plate and solid heavy duty bar with substantial top plate. Fixing that simply attaches to your table top. 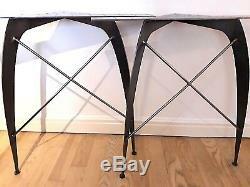 This is ideal for table widths 82cm - 92cm. We are designer makers who. Exceed in pushing ourselves to make attractive unique shapes and forms and bring something different and unique to the other choices available. With Teamster we wanted a leg with industrial strength but a lighter look and feel and a beautiful curve that was pleasing on the eye. We also wanted a leg that complimented the fantastic Eames dining chair much loved and selected as the seating choice by so many. After much development and many a drawing here is the result which has outstanding looks strength and stability. The fabrication and welding is high in standard and the multi point fixing holes in the top plate make it easy to attach to your chosen table top. These legs are supplied in raw untreated format so you can wax lacquer or colour to your choice. Please note: Table top not included - only for illustration purposes. The item "EAMES INSPIRED HEAVY DUTY metal table legs handmade in the uk and unique design" is in sale since Sunday, January 6, 2019. 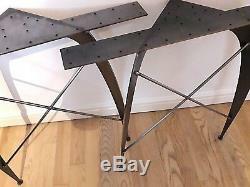 This item is in the category "Home, Furniture & DIY\Furniture\Tables\Table Parts & Accessories". The seller is "htfdifidelitythree" and is located in Hull.